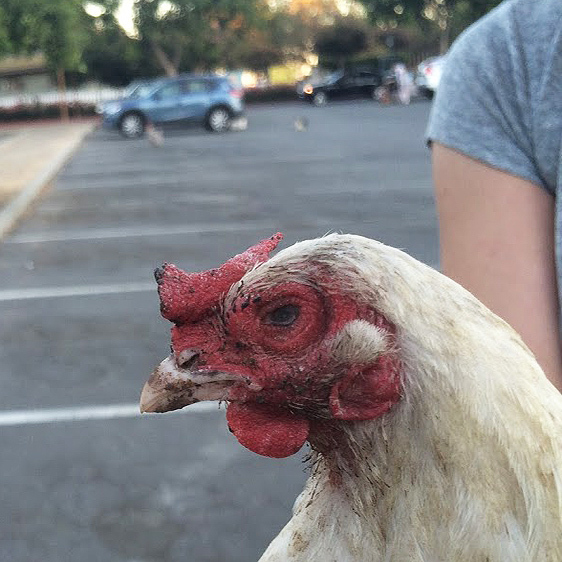 Charlie and his flock of Serama hens were found perching on a generator along the sidewalk outside of Emma Prusch Farm Park in San Jose, CA at dusk. 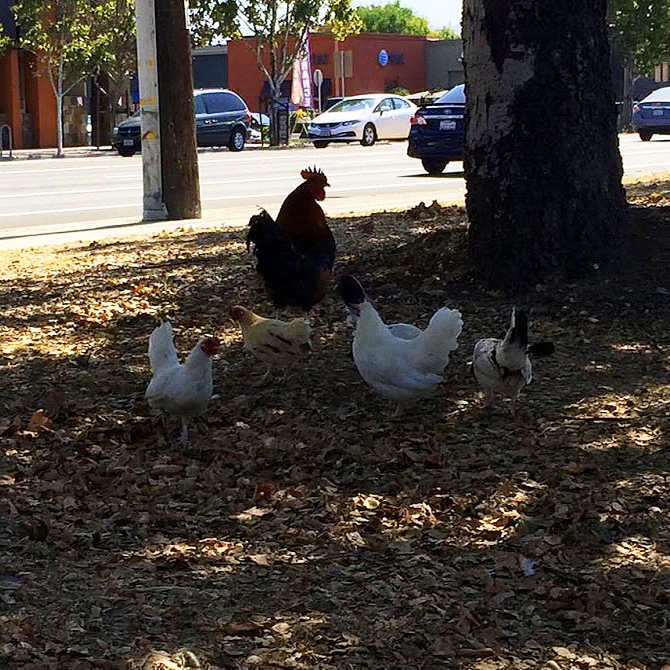 He and his flock had been spotted running in and out of the park and into the street of busy traffic for days. 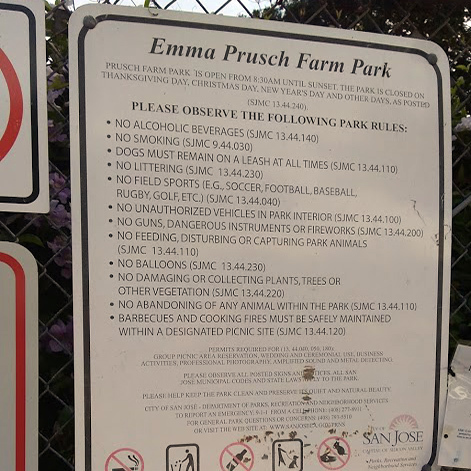 The park itself claims to own a few dozen chickens who are inside the enclosed, "petting zoo" area. 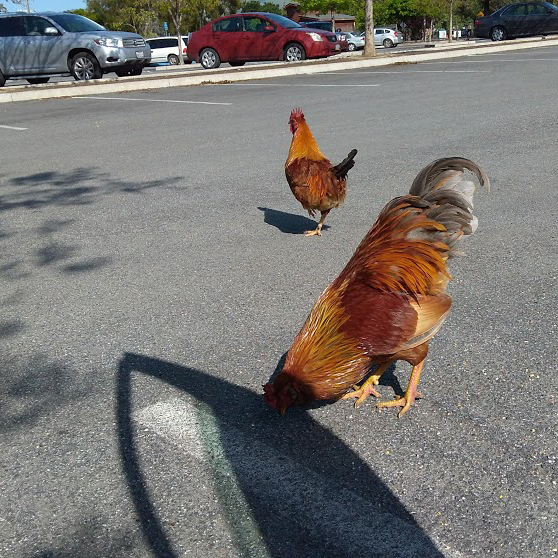 However, there are 5 times that number who roam randomly in the parking lot, sidewalks, gas stations, freeway underpass, and other areas of the park. 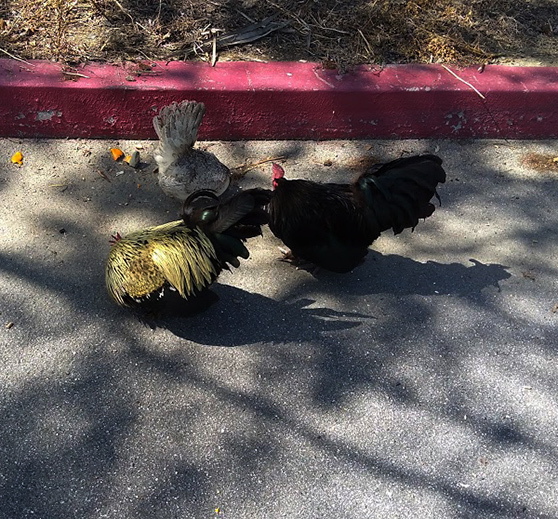 They are continuously dumped there by backyard chicken owners who decide they no longer want them. These birds are not cared for and are not protected from predators. They are regularly eaten by wild animals and/or die from starvation or dehydration. Ironically, the park has a "do not feed the birds" sign up about 25 feet away from a little feed dispenser. 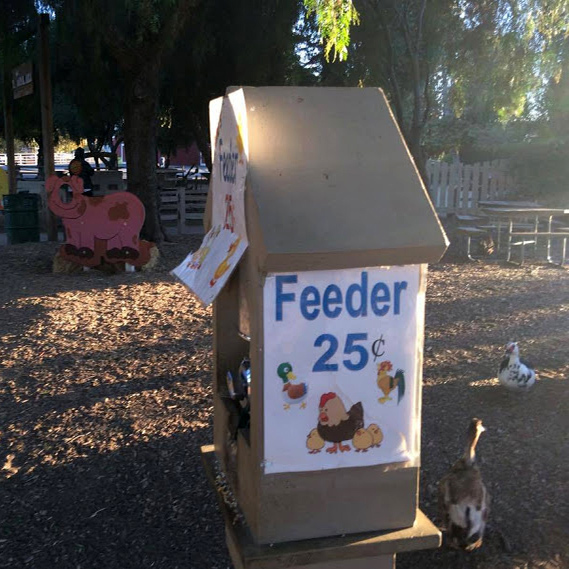 It charges $0.25 for a tiny handful of grain, which all the birds fight for (since their starving), and only the strongest eat. 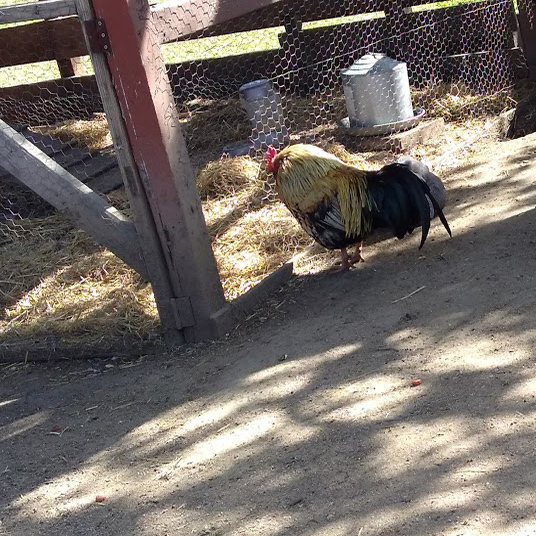 When most park visitors look at a chicken standing alone and hunched up, they assume they are resting or that it's part of their normal behavior--they don't recognize that the bird is actually very sick. Unsupervised children chase and kick at them like soccer balls. 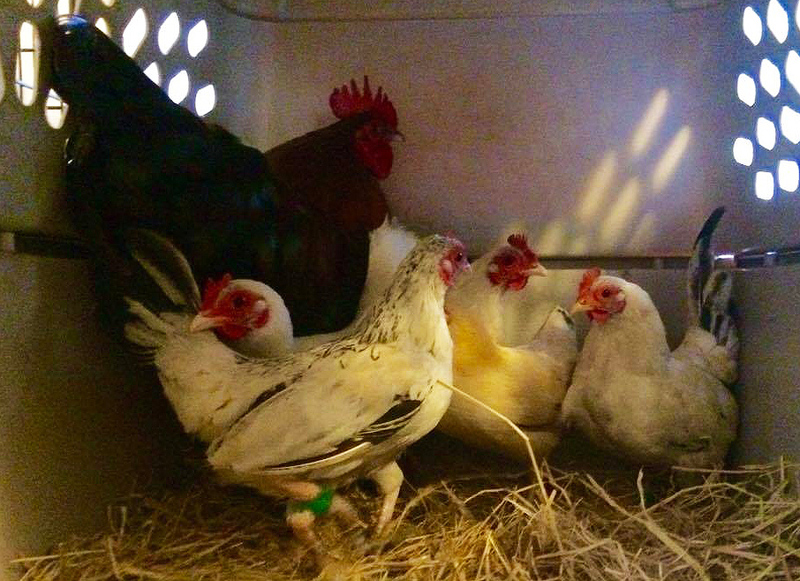 Charlie and his five hens were rescued and brought to Hen Harbor. The group of park survivors joined Rosie, a Buckeye hen who was also a newcomer to the sanctuary, because her owner couldn't afford to pay her vet bills. 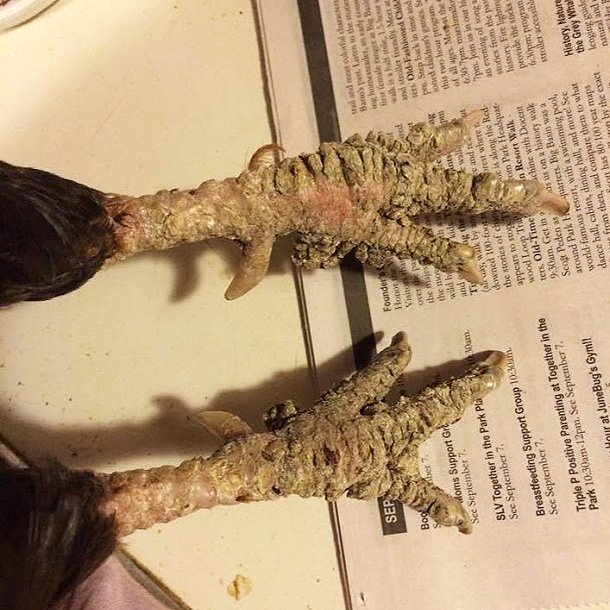 Once the birds had a good nights’ rest, Ariana, the founder of Hen Harbor, inspected their legs and feet. 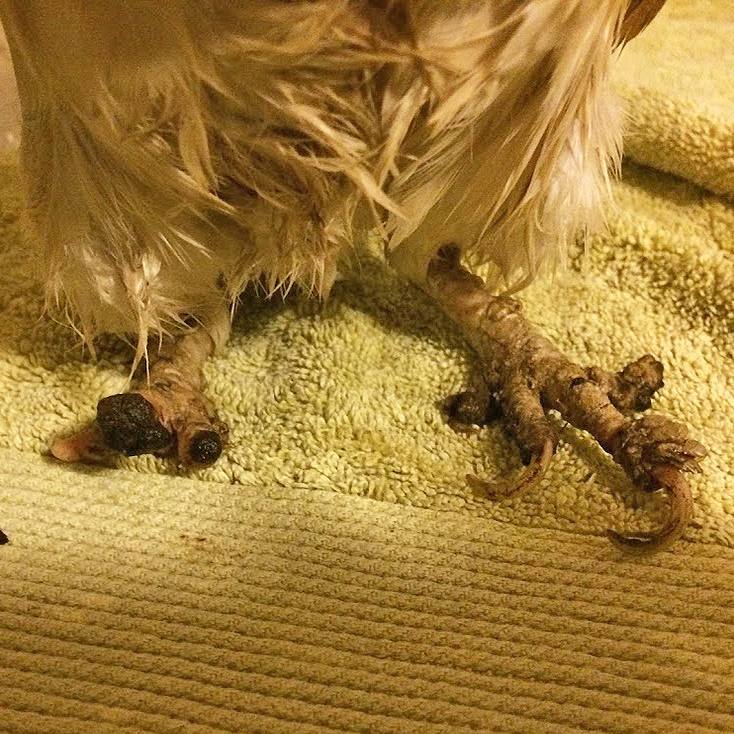 Every single one of the six chickens rescued from the park had scaly mites. 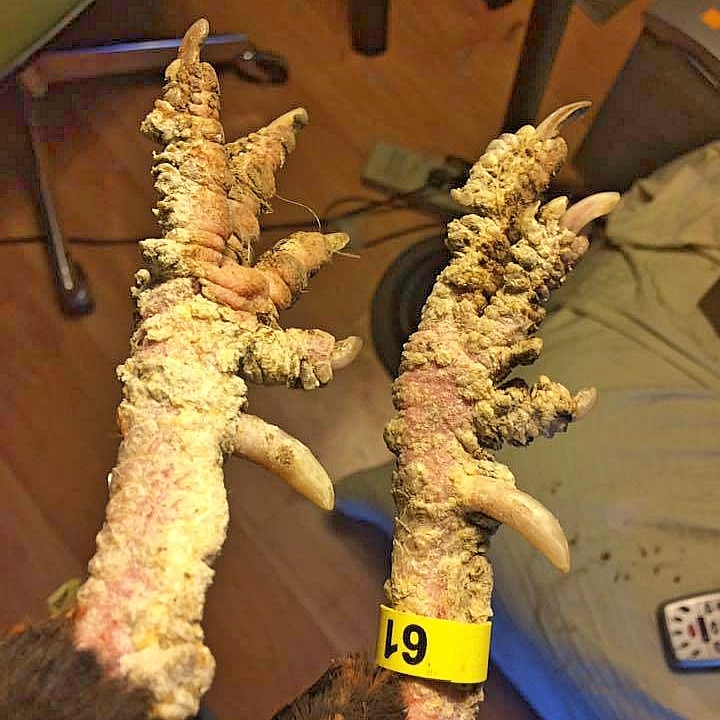 A few also had missing and rotting toes, excessively long toe nails, and blood-covered foot injuries. After giving each of the birds a bath, Ariana spritzed Frontline spray* (the same product marketed for dogs and cats) under each of their wings. 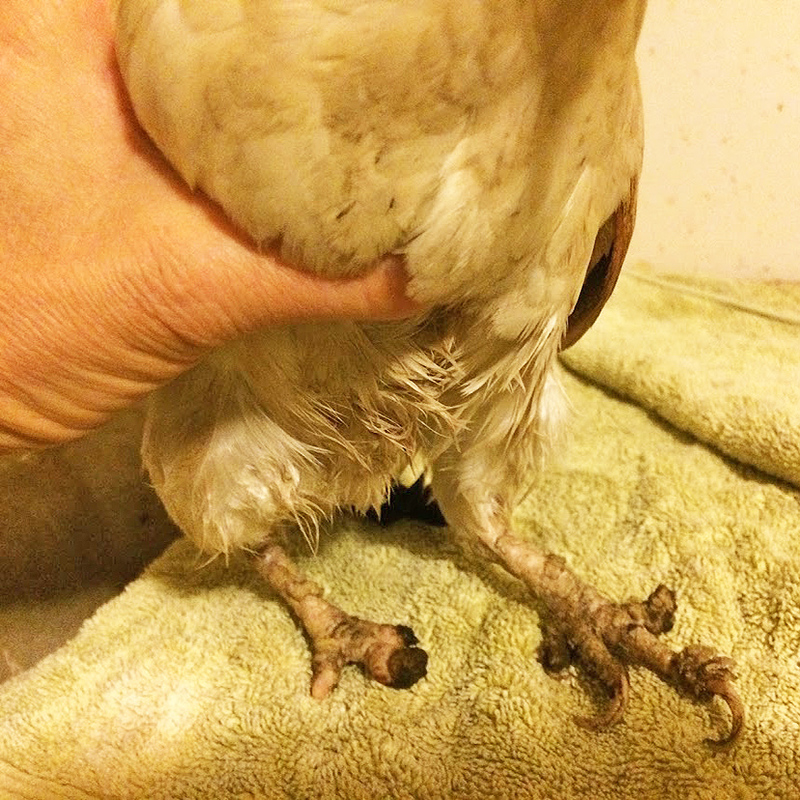 She then coated each of their legs and feet in Silver Sulfadiazine (SSD) Cream and bandaged them using no stick gauze and vet wrap. She changed each of the bird’s bandages daily and repeated this same sequence for several days. 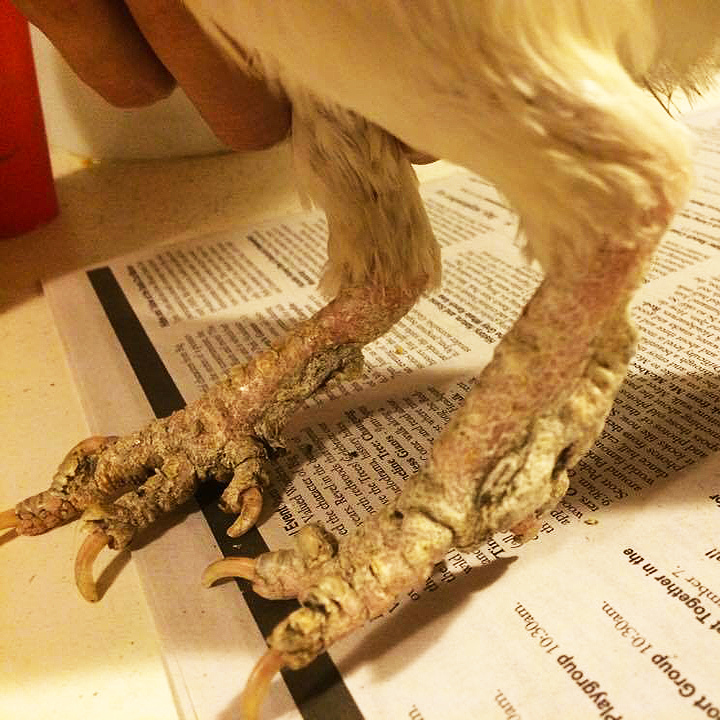 On the third day, upon removing the bandages, the damaged scales easily crumbled off the bird’s feet. 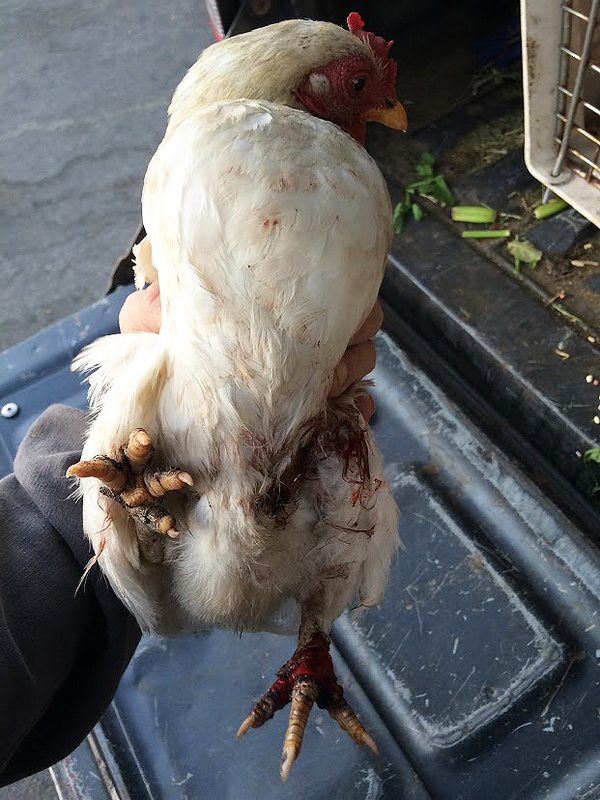 Ariana kept the bandages on the hens with the wounded feet for several more days. They were also put on a course of antibiotics (Clindamycin) per her veterinarian’s instructions. *Note that this product shouldn’t be applied on hens who are laying eggs intended to be used for human consumption. 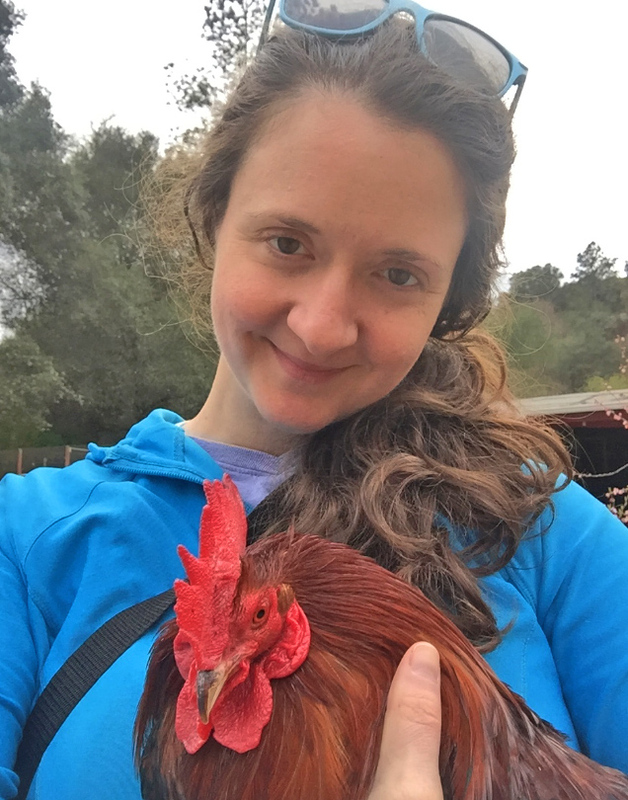 While Charlie and his flock of hens were recovering from their injuries and scaly mite infestation, Ariana was busy trying to find a kind person who would be willing to adopt them. 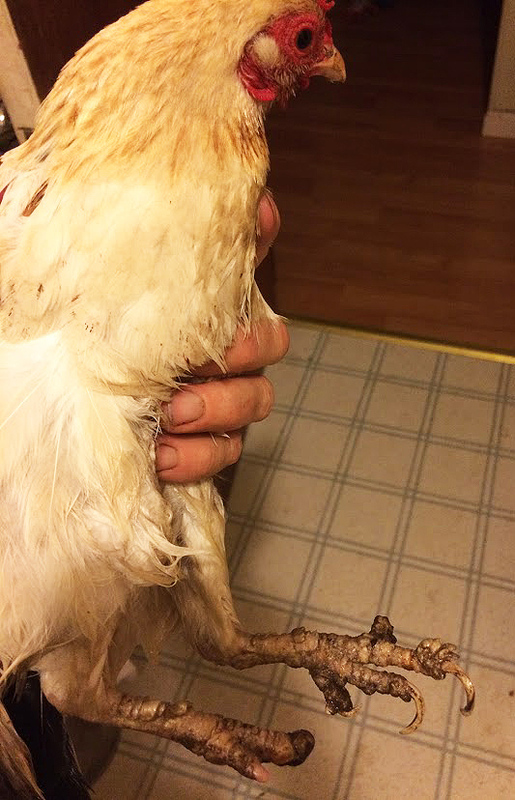 One day, she received an inquiry from Katherine, who had previously adopted several ex-battery hens. Katherine was interested in adopting more birds, however a different breed other than ex-batts, for they are so fragile. Since Ariana knew that Katherine had a predator-proof run in her backyard, which was fully covered over the top (to prevent predators from flying, climbing, or jumping over top) and anchored to the ground with a 1’ skirt along the bottom (to prevent predators from digging underneath), she told her about the little Seramas she had recently rescued. Katherine decided to drive out to Hen Harbor to see them. Upon arrival, Ariana introduced her to the tiny adorable Serama hens. She also noticed a couple birds with them---Rosie, the buckeye, and a rooster. It soon became clear to Katherine that Rosie and the rooster were part of the “package”, as they were closely bonded to each other. Katherine had no previous experience handling roosters, so she was a bit wary about adopting him. She was also unsure about how loud he might be, and whether it might upset her neighbors. Ariana ensured Katherine that he was “a very good rooster”. 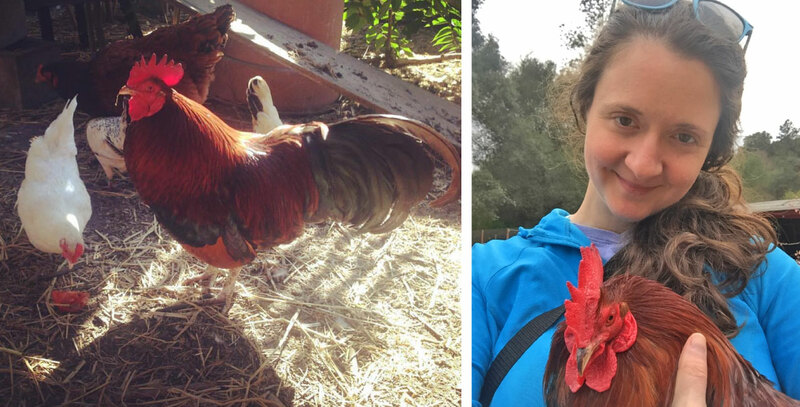 Katherine trusted Ariana and wanted to give the little birds a chance to have a loving home, so she decided to adopt the entire flock—rooster included! 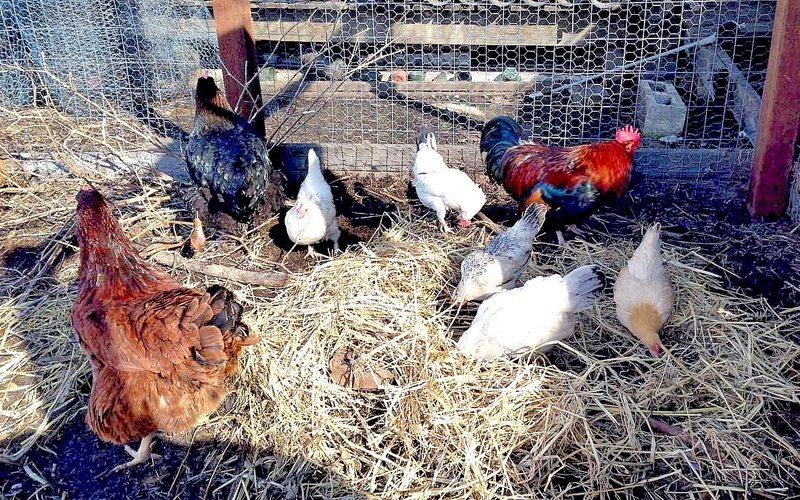 The entire flock were brought back to Katherine’s house, where she set them up in her large, predator-proof enclosure and coop in her backyard. They joined Chicki Minaj, a hen Katherine had adopted via Animal Place. At first, Katherine was expecting to hear crowing in the morning—since that is what roosters are known to do. However, each morning they didn’t hear a peep out of Charlie. Everyone settled in well. “How protective he is of his little hens. 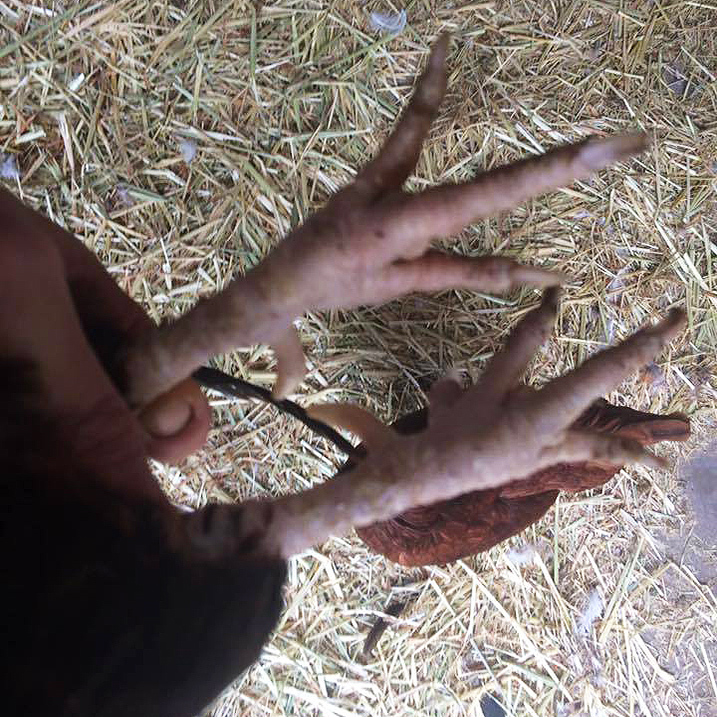 It was dusk by the time I first brought them home, so I carefully tucked them one by one inside the coop with Chicki Minaj. This went smoothly until they started to rouse and the little ones kept popping out of the coop. As I started to fetch them, Charlie poked his head out of the coop and called to them as he marched down the narrow ramp. They responded and hopped on the ramp. 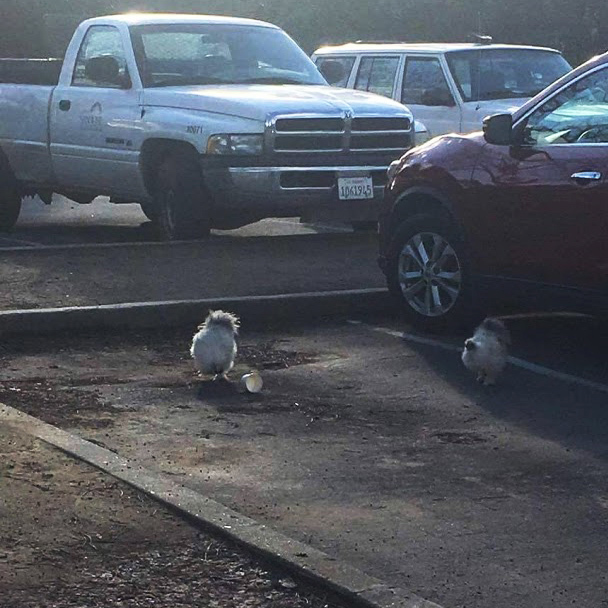 He let them go in front of him, but then they stopped and sat on the ramp in a row. He kept chirping at them, and then finally shoved them in! It was hilarious and so sweet… he wasn’t going to bed until everyone was safely inside. Since then, they’ve decided to sleep on top of the coop or in a small tree that has sprouted inside the enclosure… but always together. 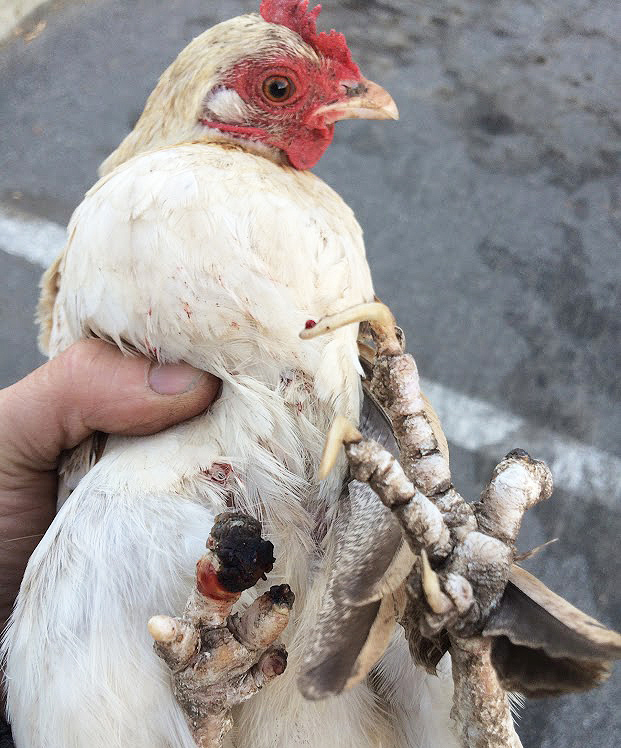 They nestle under or next to him and he spreads his wings over them like a momma hen – so precious! 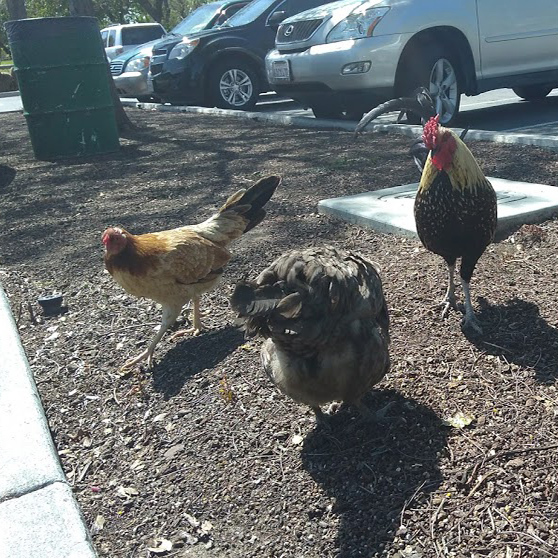 I was worried about them being too cold outside the coop, but Ariana said that perhaps they were used to that from being at the petting zoo. 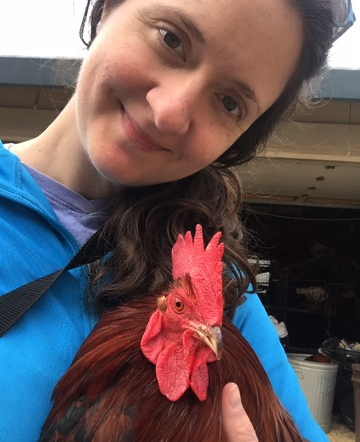 Adding a rooster to a flock of hens has numerous benefits---both for the well being of the flock and entertainment for the people who care for them. 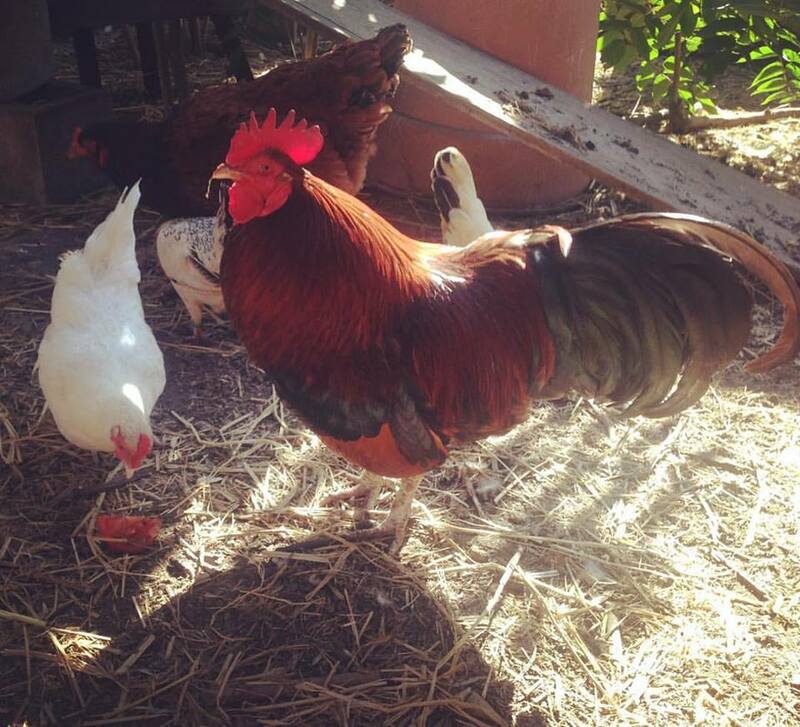 Roosters protect their flocks, dance to impress their ladies, keep them fed, and sing songs in the morning. Fun Fact: Did you know that a rooster’s crow (their song) is equivalent to a dog barking and a lawn mower (all three are 90 decibels)?